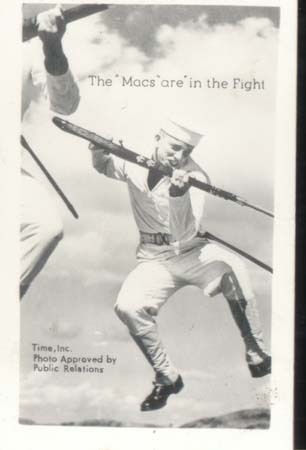 WWII Navy mini photo Mac progress Shows MAC They are in the fight Time Inc Photo approved by public relations are the words on this one. These were the official sanctioned photos of the Navy. This little photo came out of a Navy scrapbook from the year 1943. Excellent condition. Please note picture is larger than photo. 1 3/4 x 2 3/4"
Items Similar To "WWII Navy Mini Photo Mac In The Fight"